This past Saturday October 15th was my open house on the Piedmont Pilgrimage model railroad tour. The tour started on the 15th and I was the very first layout on the tour. This year there was one less railroad in the area as George Potter passed away and we lost his excellent layout which featured over 400 feet of double mainline. George was a great person and wonderful modeler. Since my layout is one of the greatest distance from the Atlanta area I didn’t know what to expect for the number of visitors as it’s over an hours drive for most people. 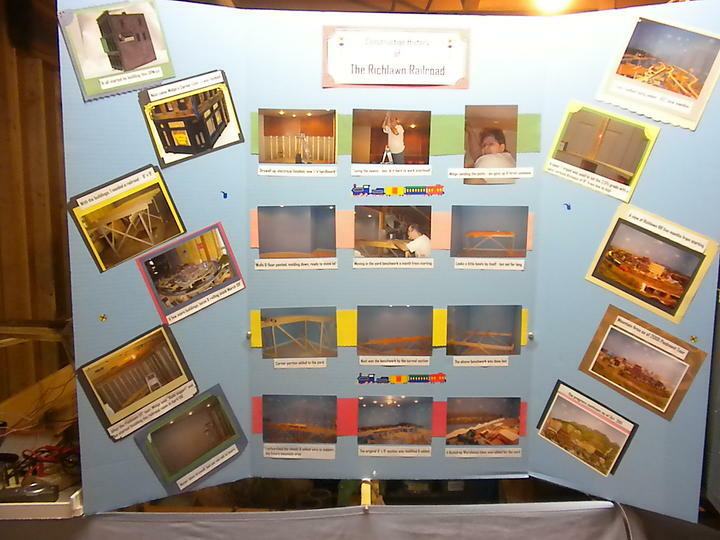 Here’s the greeting table along with the monitor that will display the train cam and a history board of the construction. 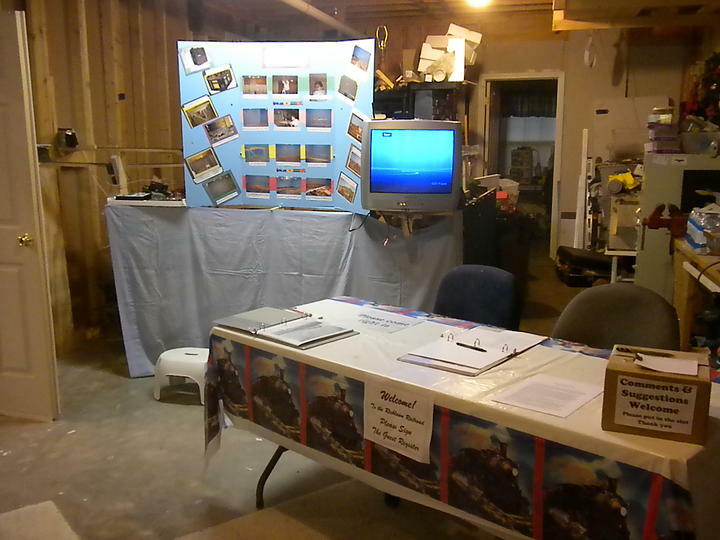 Besides the registration sheet visitors had access to a suggestion/comment box, L&N motive power book, background mural artist business cards, Piedmont tour books,history of the railroad handouts and prints of the cover page of my articles in Model Railroad Hobbyist. Out of the picture on the left is the refreshment table featuring bottled water and an assortment of cookies. My wife made the history board which shows the evolution of the layout from the very first building to the present date. I toyed with the idea of using a computer to display the pictures, but sometimes an old fashioned hard printout is the best method. The artist (left) Linda that painted my background mural watches as visitors go over the pictures of the layout. Linda circulated talking to people about her artistic work and answering questions. She had a number of people that took her card and are interested in using her services. 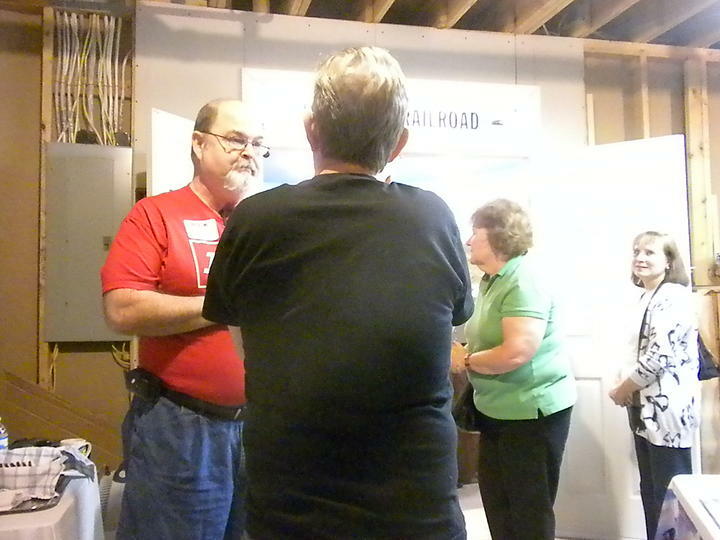 Yours truly (left in the red L&N shirt) listens to one of the guests talking about his model railroad. I was blessed with four operator assistants (3 from our operating group) so I had lots of time to talk to visitors. There were many questions about the static grass in the field in front of Hoovertown and the construction of the mountain. I broke out my homemade “Grass-O-Matic Turbo 5000” static grass applicator and referred people to MRH for instructions on how to make their own. As a matter of fact I told most of the people about MRH and had a flyer on the table with their website. As with any open house there is a “crunch time” when the largest number of visitors are present at one time. For me it was around 12:30pm when we had over 20 people at one time. 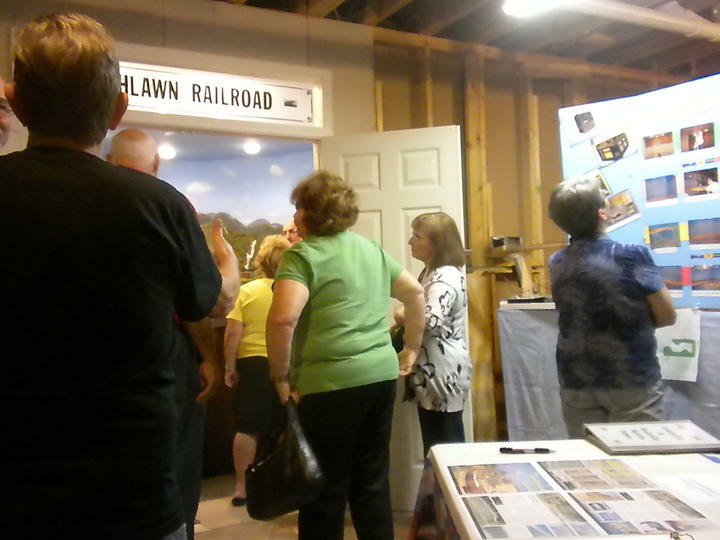 The guests were patient and waited their turn to go into the layout room. This gave me time to talk to more visitors. 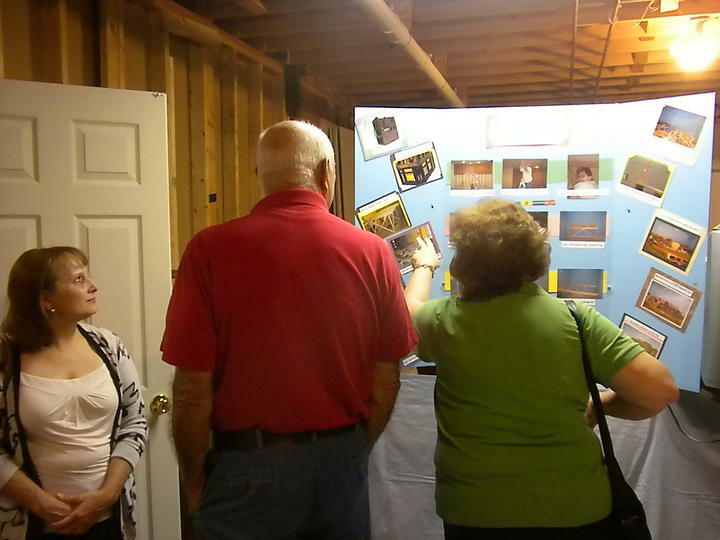 The open house was a great success with 55 visitors and a good time was had by all!